NES The Adventures of Captain Comic (USA) in 07:30.29 by RobynS. The Adventures of Captain Comic is an unlicensed port of an MS-DOS game to the NES. 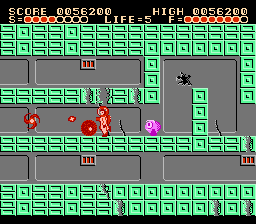 It was created by Color Dreams, a company famous for bypassing the NES' lockout chip and producing poor quality unlicensed games. The story is that galactic hero Captain Comic must recover three treasures which have been stolen away and hidden on the remote planet of Tambi. The author, RobynS, picks up all three treasures and completes the game in only seven and a half minutes. This run is 32 frames faster than the previous run of this game by Randil.